Why Are Sows in Factory Farms Dying in Surprising Numbers? Today's sows are being bred to produce more babies faster. They're also dying early and unexpectedly in many large-scale farming operations. The hog industry is losing sows—pigs that are raised solely for the purpose of breeding other pigs—at an increasing rate. Reports vary, but the number shared last year at an annual gathering of pork producers showed a rise in sow deaths from 5.8 percent to 10.2 percent in just the last three years. These animals have been dying for a range of reasons, ranging from accidents, to disease and heart problems, for years. But the recent rise in numbers may be caused by a troubling rise in prolapse—or the collapse of the animal’s rectums, vaginas, and uteruses. And while the industry is scrambling for data and solutions, some experts wonder whether this is just the latest result of the larger trend toward engineering farm animals for profit—regardless of their suffering and early mortality. Then, this April, the National Pork Board announced a multi-year research collaboration with Iowa State University’s Iowa Pork Industry Center (IPIC) designed to get a big-picture read on the problem. Iowa is the nation’s top pork producer by a sizable margin, and the Pork Board uses checkoff dollars collected from all the nation’s pork producers to fund industry research and promotion. The study, which is still underway, aims to collect detailed data from 400,000 sows—or around 7.5 percent of the 3 million sows that are bred at one time in the U.S.—on more than 100 farms across 16 U.S. states. Dr. Dave Pyburn, vice president of science and technology with the National Pork Board, said members of the board’s farmer-led animal science committee have heard from farmers who are seeing alarming numbers of animals die of this issue and others who haven’t. The hope with the research, he says, is to determine whether or not prolapse is an industry-wide problem and, if so, “to develop strategies to mitigate the problem.” Pyburn added that the board has put a sizable 20 percent of its annual research budget toward the effort. “The animal science committee teamed up with the animal welfare committee here and they put together a million dollars … and then they got the government to match it through a NIFA grant. So, it’s something that we take seriously,” says Pyburn. Dr. Tom Berkman, executive director of American Association of Swine Veterinarians (AASV), a group that educates veterinarians around the country, says AASV has also created a sow prolapse working group, but their findings so far have been inconclusive. He added that the problem seems to correlate with a number of different factors and seems to be episodic. “It’s a topic in our meetings, both in the hallways and the meeting spaces,” he added. But the group is waiting on more data. Increases in sow mortality raise concerns for both farmers and animals. And it’s taking place at a time when the pork industry is growing rapidly. There were around 73 million hogs being raised on U.S. farms in June, the highest recorded number since the U.S. Department of Agriculture (USDA) started recording the number in 1964. In 2012, the year of the last the U.S. agriculture census, the industry had grown nearly 25 percent since 2007 and was worth $22.5 billion. Since then, the growth has shown no sign of slowing down—thanks in part to pork exports, which rose 7.5 percent between 2016 and 2017 and are forecast to grow by a whopping 24 percent by 2027. The vast majority of those pigs—an estimated 97 percent—are being raised in closed barns or confined feeding operations, where sows are often the most confined—living the majority of their lives in gestation or birthing crates that don’t allow them to get up or turn around. Although farms’ bottom lines suffer significantly when sows die prematurely, prolapses and other causes of early sow death—such as lameness, disease, and the existence of mycotoxins from mold in their food—may only add to a difficult and short-lived existence for the sows it impacts. Modern hog farming is invisible to most consumers. It takes place in indoor barns and most operations focus either on farrowing, wherein sows are continually either being impregnated, giving birth, or nursing their piglets, or separate operations that feed “grower hogs” until they hit market weight for slaughter. In a farrowing system, the average sow produces around 23.5 piglets per year—or 10 per litter at an industry target rate of 2.35 litters annually. Across the country, some 33.2 million pigs enter the system per year. If the sows die before the piglets are weaned, the loss can also impact their health and rate of survival. After 2-4 litters, however, most sows tend to get replaced by younger gilts who can produce piglets at a higher rate. When this happens, the sows being replaced are typically culled and sold to sausage companies like Jimmy Dean. Across the industry, losing sows just seems to be a typical part of the way these systems work. Mortality target numbers tend to hover around 5 percent, meaning that a “normal” year would still result in thousands of animals that die prematurely. For context, the broiler chicken industry has gotten its average mortality numbers down to 4.4 percent. All this begs the question: How many animals is it acceptable to lose in a livestock operation? 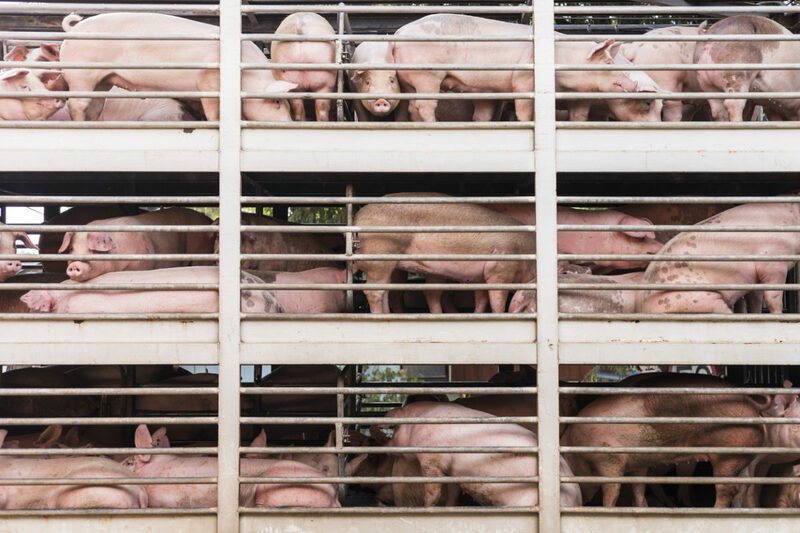 Leah Garces, executive director of the U.S. branch of Compassion in World Farming, sees the challenge of sow mortality as a sign that confinement hog operations just aren’t designed to be humane or sustainable over the long term. “We’ve bred a contradiction into these animals,” says Garces. “Over the last few decades, sows have been bred to have less back fat—because people don’t want to eat as much fat—but we also want them to produce more and more babies. And that’s not biologically possible; their bones are weak and they don’t have enough fat to support the reproductive process. We’ve bred them to their limit and the animals are telling us that,” she added. Temple Grandin, author, professor of animal science at Colorado State University, and livestock handling facility designer, said that she has seen some breeders dial back the effort to cut down on back fat in the breeding process in recent years. But she also described the ways in which highly focused breeding across the livestock industry has led to unintended consequences. Grandin hasn’t looked into sow mortality as it relates to prolapse, and she says if it is a breeding issue, it’s probably something that can be fixed. But it might not allow for the kind of rapid growth in productivity the hog industry has come to expect. “Obviously mortality at any stage is a very bad thing,” says Bob Ruth, the owner of Country View Family Farms and senior vice president at The Clemens Food Group. He says the farmers he works with haven’t seen a rise in mortality due to prolapse. And he acknowledged that any sow loss can be expensive. “It’s very costly because breeding females are purebred animals, so on average they would cost between $250 and $350 dollars. And so, it’s in everybody’s best interests to keep as many of those animals as alive for as long as we can through the production system,” says Ruth. Country View has moved away from gestation crates for its sows thanks to an emergent technology called the electronic sow feeders (or ESFs) which cuts down on the kinds of aggressive behavior sows can display in group housing. This systems has been lauded as more humane for sows because it allows them the freedom to move around while they’re pregnant. But Ruth doesn’t know whether there is any link between this system and the fact that they haven’t seen rising rates of prolapse. Paul Willis, founder of Niman Ranch, now a subsidiary of Perdue Farms, says the high incidents of animal loss in confinement systems is one of the reasons he spent years building an alternative to modern hog farming. Many of the farmers working for Niman Ranch, a company that has built a market for higher-end consumers willing to pay more for meat they deem better for the animals, often breed their sows for longer than is standard in confinement operations, says Willis. “They also get half as many piglets per year as they do in intense, industrial systems,” he adds. Both Smithfield Foods and the Iowa Pork Industry Center declined to comment for this article. A version of this story also appeared in the Guardian. Factory farming is an abomination. Consumers need to be educated about them and the health risks associated with the consumption and raising of animals in this way. We need to stop pushing bacon everything and “the other white meat” . We need to quell big ag’s pressure on farmers to go faster, bigger for profit and inflated marketing tactics. I cry for the animals. Hardly surprising that these wretched animals deprived of nearly all the requisite conditions which make life worthwhile for them, are showing that the time has come to replace factory farming with a more gentle slower growing system. Also not surprisingly no-one in the industry is prepared to consider anything but greed. I suggest a long, hard look at the feed: GMO verses non-GMO feed. And look at the pesticide residues being consumed.